Enjoy live music and beer garden and participate in BBQ brisket cook off. Sitka Histroical Society provides contestants with full brisket – includes point & flat – free of charge. No entry fee. The Sitka Historical Society will purchase one (1) – 11 to 15 lb brisket for all contestants (if requested) for the contest. Entry deadline – Oct. 17, 2018. 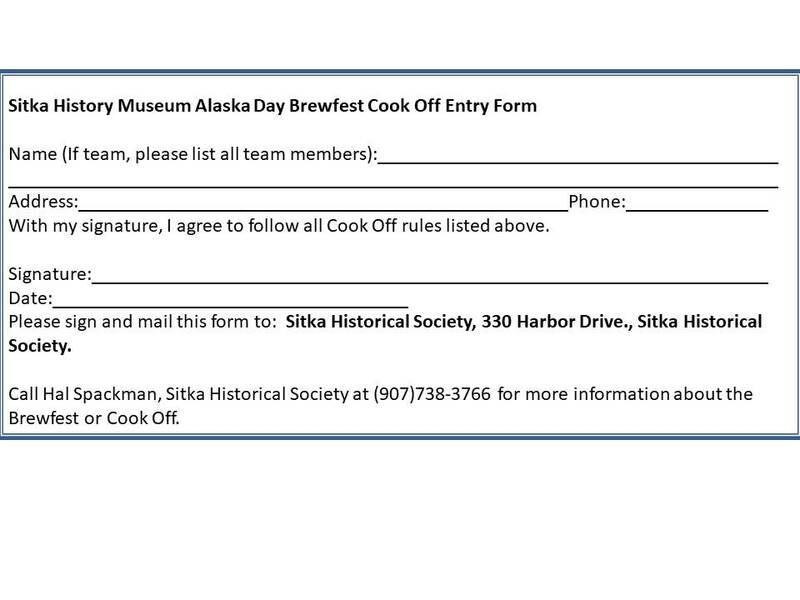 Call Hal Spackman (907)738-3766 for entry form below and mail to: Sitka Historical Society, AK Day Brewfest Cook Off, 210 Seward St., Sitka, AK 99835. Entries may be individuals or teams. Contestants will be assigned a covered, open air, tented area on October 18. Contestants are to prepare and cook in the most sanitary manner possible. * See attached Safety Rules. Contestants may prepare entrées at home and bring finished entrée to the Brewfest. However, food must never fall below a hot holding temperature of 140 degrees Fahrenheit. Contestants may not sell any food or beverages, other than their entered entrée, at the Brewfest. Profits from the sell of the brisket will be go to the Sitka Historical Society. Contestants must cook a minimum of 10 pounds of brisket. Brisket must be cooked on wood, or wood pellet heat, no sous-vides, par boiling or deep-frying allowed. Contestants must provide their own heat/cooking sources (SHS will provide electric plug ins). Tented area will be open for contestants to bring their own BBQ station for preparing brisket at 6:00 a.m., Oct. 18 (Contestants wishing to start earlier may request a space one day prior to the event). Brisket will be judged on taste, appearance, and texture. Precautions must be made to prevent fire and accidents. Contestants may reserve one serving for tasting and for the cook / team; but agree to donate the rest of their brisket to the Sitka History Museum (SHS will provide plates, forks and napkins). BBQ Brisket will be judged at 3:30 P.M.
Contestants must submit for judging at least 3 slices of flat and 3 slices of point with burnt ends. Sauce is optional; all submissions shall be in unmarked containers provided by the judges. The Committee Chairperson reserves the right to make additional regulations as situations warrant. Important: Please note, neither the Sitka Historical Society nor Totem Square Inn will be responsible for any accidents, theft, injuries, etc. during the Brew Festival Cook Off.